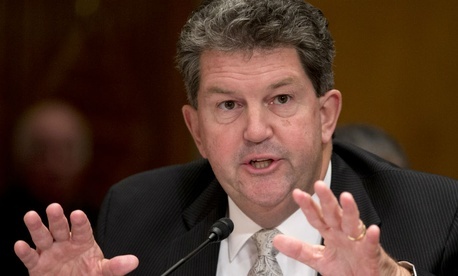 Postmaster General Patrick Donahoe will leave his role as the head of the U.S. Postal Service, the agency’s board of governors announced Friday. Donahoe has served as USPS postmaster general and CEO since 2010. His tenure has largely been marked by cutting the agency’s workforce and infrastructure to adapt to the dramatically declining mail volume and revenue. The outgoing postmaster general, who has worked at the Postal Service for 39 years since he began his career as a clerk in Pittsburgh, Pa., has often butted heads with Congress, his employees and labor groups, some of whom said his plans for the future of the agency were too extreme and unnecessary. Workforce cuts were well under way before Donahoe took office, but he has overseen a reduction of 100,000 employees. During his tenure, Donahoe instituted the Post Plan, which reduced hours at underused post offices, and the agency’s “network rationalization” plan, which has shuttered 141 processing plants since 2012 and will close another 82 facilities next year. Donahoe has trumpeted his ability to make these cuts without laying off a single employee and with minimal impact on mail delivery. He has steered the agency toward a focus on package and shipping services, where revenues have grown significantly in recent years. He has defended his strategy every step of the way as an unfortunate but necessary one to move the Postal Service back to profitability in the reality of a decreased market for mail. Donahoe has been a one-man crusader for comprehensive postal reform, calling for Congress to act to lift undue burdens on the agency at virtually every public appearance he has made in recent years. His efforts have repeatedly fallen short, with competing interests continually preventing lawmakers from striking a compromise. Mickey Barnett, chairman of the board, said the true test of success as a leader of a large organization is if the individual left it better than when he started. “Pat passes that test with flying colors,” Barnett said. Megan Brennan, the current USPS chief operating officer, will take over as postmaster general on Feb. 1, 2015. She will be the first ever female to serve in the position. Donahoe’s retirement is a major coup for postal unions, which have been calling for his ouster for months. Postal management is scheduled to begin labor negotiations in February, which Donahoe said on Friday contributed to his decision to leave the agency. “We have to have somebody sitting there who has a long runway,” Donahoe said of the upcoming bargaining period. He added it was a good time to leave because the agency is on the precipice of exploring new revenue streams. Labor leaders told Donahoe, in so many words, not to let the door hit him on the way out. It is unlikely, however, that Brennan will reverse course. As COO, Brennan was a close aide to Donahoe and played a key role in crafting his long-term vision for the agency.